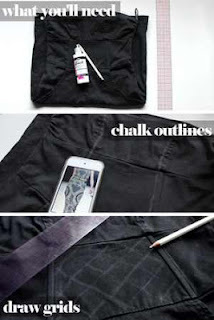 This Balmain inspired DIY that I discovered posted on Chictopia.com by lipglossandblack is totally awesome! The embellished, pearl studded, highly detailed lux trend that Balmain amped up for their Fall/Winter 2012-13 Collection has been worn on many occasions and by many celebs this season. One of Balmain's embellished pair of pants costs upward of $7000. So of course finding a fairly simple tutorial that will help you accomplish a similar look is very Notable.